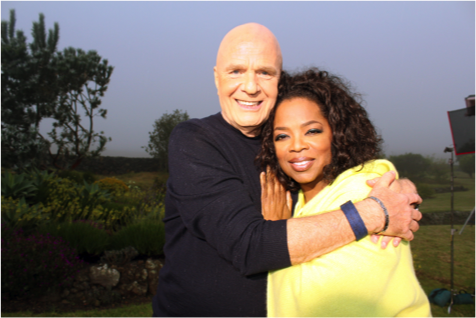 This Sunday, Dr. Wayne Dyer is making his TV acting debut. Sure the "Father of Motivation" had been giving spiritual speeches over the airwaves since the 1970s, but this time he is in a dramatic feature film. The Shift, which airs on OWN's "Super Soul Sunday" block of programming, explores Dyer's teachings of moving away from our ego driven existence and towards a higher consciousness. It stars Portia de Rossi and Michael DeLuise as a housewife and a director yearning to find purpose in their own lives. Wayne plays himself in the film, helping to guide the lost souls through their journeys. In a recent exclusive interview we asked him why he chose to try his hand at acting. He stated, "For me, it was a life shifting thing myself, because I've been a speaker and a writer my whole life and I've always done things very spontaneously without notes. I just go before audiences and speak and I found out that you don't make movies that way. So I had to take a couple of acting lessons and really decide at the age of 68 that it's never too late to move in a new direction in your life." Wayne discussed why they decided to make a dramatic film. "I've always believed that the best way to influence people is to use as many media approaches as possible. I heard a statistic that said that only 10% of the population buys 100% of the books. So that 90% of the population in the United States never buys a book at all. But they do go to the movies." So he saw this film as a way to "make an impact in the world, which has always been my goal, to create a shift in consciousness." He continued, "I've always said that it's only through a shift in consciousness that the world will be transformed. And so we undertook this idea of creating a film." Wayne decided he wanted to create a movie. He said, "I wanted it to be a drama. I wanted it to tell stories." So he enlisted director Michael Goorjian to help him with his vision. "We created these three stories around this whole idea of my being able to play myself... It became a personal project of mine and it's something that I'm very, very proud of." And it seems others involved with the film also took something away from it. He approached his friend Portia DeRossi and asked her to star in the film. He recalled what he said to her at the time, "'I can tell you this, Portia. There will come a day when you look back on your acting career, and this may seem like a small film and investment of your time right now, but you'll look back and say this is one of the proudest moments that you've had.' And last time I saw her, she had said that to me." But to Wayne it was not abut getting the big star or stroking his own ego, he wanted to help the world. And he hopes that if enough people see the film and change their point of view, he can do just that. "I have a goal to have ten million people watch this film. I believe that when we reach a certain number of people in a population — in physics they call it phase transition — you hit a critical mass. Stories are told about the hundredth monkey, when you hit that hundredth monkey, when you hit a certain number of people, then all the rest of the members of the population start to align." He described a physics experiments, in which by arbitrarily adjusting the electrons in an atom, eventually all the electrons begin to align. He explained, "When they hit that one point then all the rest of the electrons automatically begin to make that shift. And I think human beings have the same potential. If we get enough people to shift our consciousness and move away from violence and move towards a way of resolving our disputes, which are based on love and kindness and peace, I think we can transform the world. That's my role in the movie." He recalled that it took four or five days before he stopped trying to act and just began to relax. From then on, everything fell in to place. "There came a moment when I just had an insight. I remember the scene, I remember what we were doing. And a lightbulb just went off inside of me and it just said, 'Wayne, just be yourself. Just go out there and be yourself. This is really a film about ideas that you have been speaking about... Just go out there and be. This is you.' And I had a breath of relief and took a deep breath and... it all came out so beautifully." In fact filming was so trouble-free, those around him questioned why. He recounted, "Every time there was any kind of a little obstacle it just seemed to [be easy to resolve.] Even the cast members and the directors would come up to me and say, 'What is going on here with this film? It's like everything just seems to fall into place. You're just so lucky.' And I said, 'It has nothing to do with luck. It has to do with a divine hand working on a very important project.'" And so Wayne has been spreading the word about the film that seemed destined to be made and about getting to that hundredth monkey. "Once we get the ten millionth person to watch it, people automatically will begin to come around to this new idea that this movie talks about. We can shift our consciousness and create the world that we want. We just have to change the way that we look at it and what we're looking at will change." Watch The Shift on Super Soul Sunday on April 1 at 11 a.m. EST/10 a.m Central on OWN.